FOCUS ON THE SOLUTION, SB 562- GUARANTEED HEALTH CARE FOR ALL! The California Nurses Association and the campaign for the Healthy California Act, a coalition comprised of 350 organizations representing over six million Californians, held high-energy, well-attended rallies at the state Capitol for two days, Oct. 23 and 24, in support of SB 562, legislation that would guarantee health coverage to all Californians and eliminate premiums, deductibles and other out-of-pocket health costs. The rallies were scheduled to coincide with the first round of Assembly Select Committee Hearings on Health Care Delivery Systems and Universal Coverage. Assembly Speaker Anthony Rendon created the so-called Select Committee as a stalling tactic, rather than follow democratic process and allow SB 562 to move forward in the Assembly after it passed the Senate in June. Despite widespread constituent support for single payer in California, the agenda of the first hearing did not include discussion of SB 562, nor did the committee invite participation of SB 562’s primary sponsors, the California Nurses Association. This could have something to do with the fact that the Select Committee Co-Chairs, Jim Wood and Joaquin Arambula are the 1st and 3rd highest recipients respectively of cash contributions from the health and insurance sectors combined as compared to all 80 Assembly Members of the California Legislature. For two mid-mornings in a row, under balmy skies, numerous speakers addressed the enthusiastic rally crowds on the North Steps of the State Capitol including CNA boardmembers, Cathy Kennedy and Cathy Dennis, RNs Rochelle Pardue-Okimoto and Melissa Johnson-Camacho, retired RN Elizabeth Pataki, Hene Kelly of California Alliance of Retired Americans, oncologist, Dr. Paul Song of Physicians for a National Health Program-California, and other community allies. Speakers highlighted how important it is to provide actual health care, not just insurance and that, until we start talking about that as the goal and work backwards from that, the legislators’ talk is a waste of time. Rochelle Pardue-Okimoto, an RN at Alta Bates Hospital in Berkeley shared several stories with the audience that underscored some of the many problems that persist despite the Affordable Care Act. “We can all fall through the cracks! Employer-based healthcare where you’re only good if you’re healthy and employed does not work,” said Pardue-Okimoto. “I saw this in my very own hospital in my very own unit when one of my colleagues in the NICU got cancer. She got sicker and sicker until she couldn’t work and then the hospital called her up and said if you don’t come back into work, we’re going to cut off your insurance. So what did she do? She got up out of her bed and had someone carry her in to the hospital so she could do a nightshift! How is that California? How is that America? Who here would like to be on their deathbed and then have to go work a night shift at the hospital? We need to change our system. “There’s another person I’d really like to tell you about,” continued Pardue-Okimoto. “His name is Sam. He was a NICU baby. He could fit in my hands and I have small hands. He was born at 24 weeks that’s about the earliest we can save a little baby. We did a good job. He got better, he went home with his Mom and he grew and I kept in touch with his Mom through facebook. Then the Trump administration started threatening to remove the healthcare of people with pre-existing conditions. After the rally each day participants entered the Capitol building and filled the main hearing room, the upstairs balcony and the entire overflow room. Attendees were annoyed but not surprised with the proceedings on day one which consisted of presentations on the “healthcare landscape” of California by the purportedly “neutral” and ”unbiased” organization, Insure the Uninsured Project (ITUP), whose core funders include health insurers, Kaiser and Blue Shield. The line for the public comment period at the conclusion of the official presentations on both days snaked around the hearing room, out the door and down the corridor. On the line were SB 562 supporters from throughout the state, nurses, seniors, disabled, dentists, doctors and residents insisting that the Select Committee stop wasting time on a legislative detour and move forward with SB 562. Marcia Martin, a constituent from Speaker Rendon’s 63rd Assembly District in Southern California, began her comments by delivering a box of petitions to the Select Committee signed by 10,000 supporters of SB 562, gathered in just two days, Oct. 14-15, as part of a weekend of grassroots actions conducted by hundreds of volunteers in all 80 state Assembly districts. 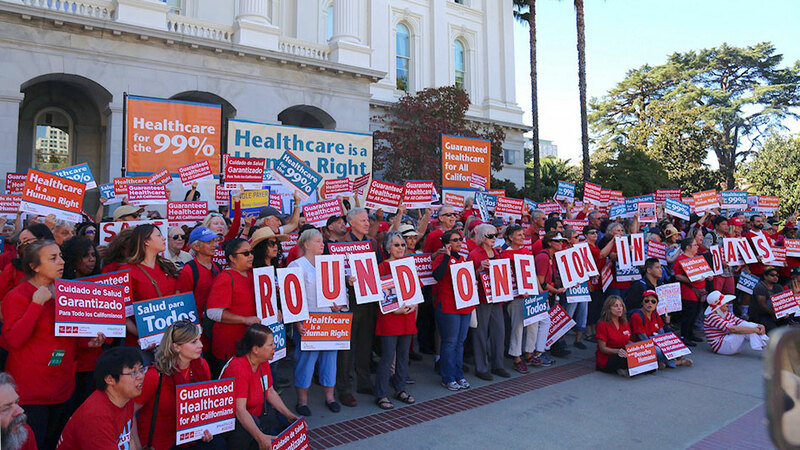 Although the Select Committee failed to put SB 562 or a discussion of single payer on their agenda, the presence of hundreds of energetic supporters at the hearings demonstrated quite powerfully that it IS most definitely ON the PEOPLE’S AGENDA.